I cannot believe June is wrapping up! Where has the time gone? I have been terrible at blogging over the last few months, and for that I apologize. My calendar is freeing up, and I am going to get back in the routine. Until then, I thought I would give you an update on how the big move and career change from Nebraska to Nevada is going. 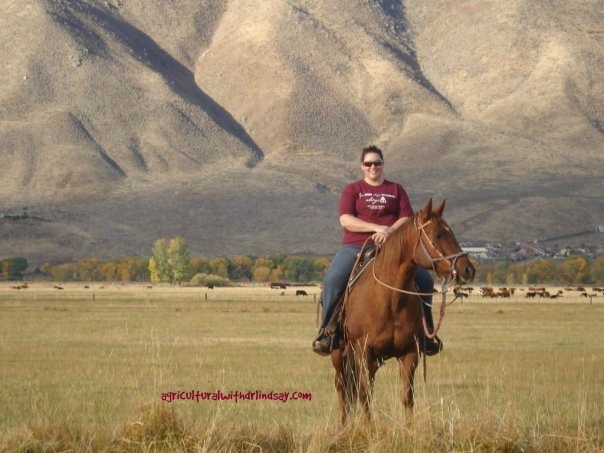 In case you need a refresher, I announced in The Book of Life: Closing and Opening Chapters that I had made the big decision to leave Nebraska Extension and head west to start a career with Nevada Extension. A main reason for making this drastic move was getting back close to the family ranch and my family here. It has been a lot of fun to celebrate holidays and special occasions with my family again. We have probably seen each other more in the last six months than we have in six years! We (the Hubs, the cat, and I) left Nebraska mid-December(ish). We picked my Dad up in Denver on day 2, and made our way across Colorado and Utah. We continued to have great weather, so on day 3 we took Nevada’s loneliest highway (Highway 50) across Nevada. When you have a roadtrip of ~1,600 miles you hope it is uneventful, and it was. We were blessed by the travel Gods. Our belongings and their transportation to Nevada weren’t so lucky. We knew when we planned the move that it could take our stuff three to ten days to arrive. Little did we know that storm after storm across the country would derail those plans. In the end it was about 20 days later when our stuff arrived. Since I had to start work in that time I had to buy a few pairs of slacks and blouses, and we camped out in the apartment for about a week. We were sure glad to see the movers arrive. Once we got our stuff and got unpacked we hit the ground running. A long journey finally came to an end when the Hubs became an official American citizen. You can read more at My story: 10 Immigration tips when marrying a non-American. Almost six years to the date of when he arrived on his fiance visa, he was raising his right hand and swearing allegiance to the USA. It was a great day, and one that we have waited for for a long time. Meanwhile, back at my office… My office manager retired about 10 days after I arrived and our part-time office assistant went on vacation. It was a little stressful to not only learn what I was supposed to do, but to also learn about our budget, how to pay bills, and the other 749 things these great ladies had been doing. Happily, we have since hired a new and fabulous Office Manager and our part-time office assistant is back. It feels great to have all of the pieces in place and to be moving forward again. I immediately partnered up with the Chamber of Commerce to offer Social Media classes to local businesses, and it has gone over very well. At the ranch, there was another great lamb crop born. Even though we had several large snow storms our family was prepared to handle them and to provide the best care for all of the animals. Read more about how we Care for baby lambs in freezing temperatures. My Mom sold several lambs to the 4-H members, and they did a great job raising them and showed them in May at the Nevada Jr. Livestock Show. This past spring was a busy one as my Dad had a knee replaced. Considering the extent of the surgery, his recovery has been great. Just weeks after the replacement he was driving the skidsteer again – hard to keep a good rancher down. And even more exciting, my nephew was born. My Mom and I have made several trips to go visit him and his parents, and we anxiously await for their visit here at the end of the summer. I think it is safe to say he has all of wrapped around his chubby little fingers. As for fun… Well the Hubs and I took advantage of the nice weather and took a long weekend to Death Valley Super Bloom… A photo journal. Neither of us had ever been there, and it was fantastic. We are already planning our next visit – when the cooler temperatures return. We are also less than 45 minutes from Lake Tahoe, so we have been enjoying that scenic beauty and all that the lake has to offer. As far as Cali cat, she handled the drive like a champ. However, the entire moving experience traumatized her. My parents have two indoor cats that are not welcoming to other cats, so Cali stayed with my Grandpa until our stuff arrived and we got unpacked (about 3 weeks). He loved the company, but she was not happy with me at all. Once we brought her home it took another month for her to get settled in. She is finally back to her old self now and is not looking forward to moving any time soon. While there was a lot of other things that happened in the last six months, these are some of the major highlights. I look forward to getting back into a regular blogging routine. As usual, it will be a mixture of current research findings and events, interesting ag stories, and introductions to the people who grow and raise our food. Do your childhood memories included horses and animals? 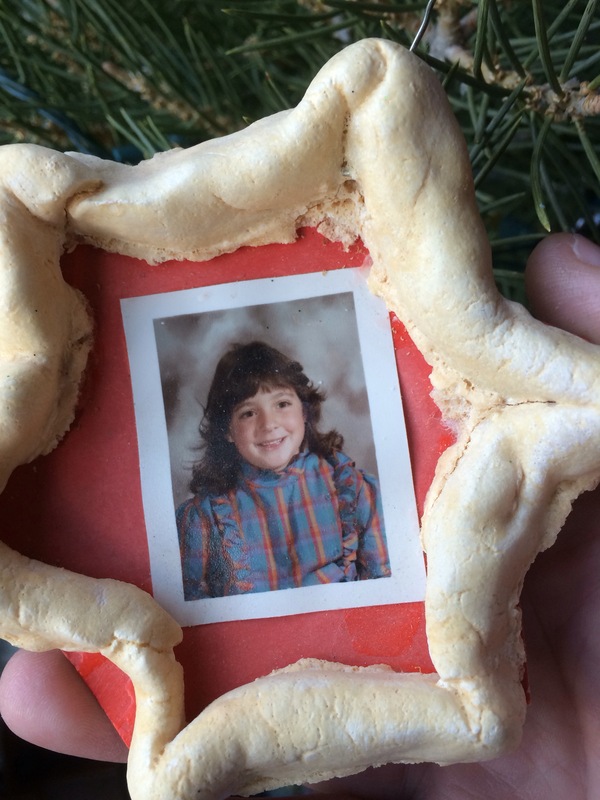 Anyone else have some handmade Christmas tree ornaments like this on their tree? T minus 14 days… Just 14 days until my last day in the office. It is official, I am leaving Nebraska Extension and have accepted a position with Nevada Extension. I left “home” when I was 19 years old to attend college in Oklahoma on a scholarship, and 18 years later I have the opportunity to return “home”. It has been bittersweet to wrap up one life, and make plans to start another. I started my career with Nebraska Extension in January 2010, in Richardson County (Southeast Nebraska). This was my first “real” job after college, and I loved it. I was working for and with great people doing things I enjoyed, and no two days were the same (a huge perk for me). In April 2013 I had the chance to move to Saunders County (Central Eastern Nebraska). In Saunders County I had the opportunity to hone my skills and put more of my degree to use by taking on a social media presence engaging with consumers about agriculture and food and working closely with an active Livestock Association. I am tremendously grateful for the opportunities I have had with Nebraska Extension, and for all of the wonderful people doing cutting edge and progressive programming. I will certainly miss many of my Husker friends. 57th Annual Saunders County Livestock Association Tour – Wyoming. As much sadness as there is in leaving and saying goodbye, there is also excitement and opportunities that await. My new office will be less than an hour from my family ranch, and I will be much closer to the majority of my extended family. I will remain in Extension, but it will take on a new role, which is ok. I do well with change… I will also have the opportunity for tenure, which is exciting to me, especially as a terminal degree holder. My new colleagues-to-be have very warm and welcoming, and I have no doubts they will welcome me home with open arms. There have been some tears shed, and undoubtedly there will be more before it is over. However, a great thing about Extension – it is like one big extended family across the country. There are conferences where I will continue to see my Nebraska Extension family. People have asked if The Hubs is excited about this move, and the answer is yes! He is excited to have another part of the country to explore. His family is excited to come and visit, as they can experience Western Nevada and Northern California and all that the area has to offer. I plan to continue Agricultural with Dr. Lindsay (AgWithDrLindsay) via all of my social media platforms. While I don’t know what it will look like yet, I hope you will follow along as one chapter closes and another opens in this book of my life. Jenny at Prairie Californian always has the most amazing recipes complete with excellent food/drink photos. Additionally, she also writes frequently about farm life and the crops her and her husband grow in North Dakota. If you aren’t following her, you should be! In Jenny’s 30 Days of Food series occurring right now (November) she is featuring an agricultural food product, showcasing the families that are growing/raising it. I am a big fan of lamb, as my family has raised it for generations. Learn more by visiting Leg of lamb marinade featuring Agricultural with Dr. Lindsay. Seeing all of the recent grads on Facebook has me reflecting on various graduations over the years. The one I was most excited for was also the one that brought the biggest change — graduating with my PhD! My advice for new grads: take time for you and do things that make you happy. It is easy to get wrapped up in the next stage of life. A little “me” time is critical for maintaining the best you (personal and professional)! 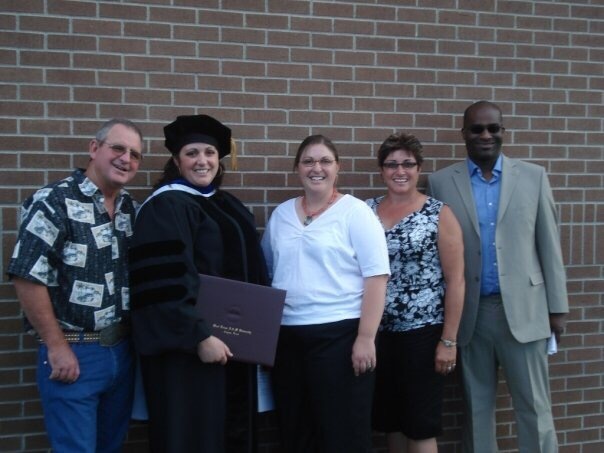 On graduation day with my parents, sister, and Hubs (circa 2009). What advice do you have for new grads? Today is National Sibling Day. My sister and I are in the same career (Extension), which is a lot of fun because we can not only bounce ideas off of each other, but when we travel to various meetings and national conferences we can be roommates! No, we are not twins… But we do get asked that a lot. Happy birthday to my favorite rancher! 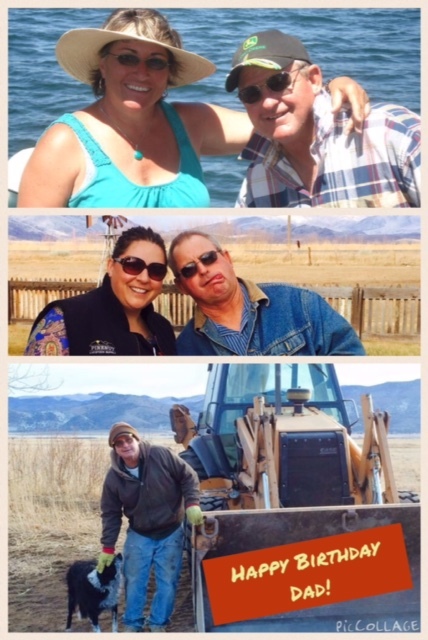 Top: My parents, Center: Dad and I, Bottom: a man, his dog, and his backhoe.